Geo-fencing is a digital marketing strategy that involves location-based mobile advertising. Businesses can draw a digital “fence” around a specific location, and as users pass through the fence, they are flagged by the GPS and can be served advertisements tailored to them across the web and through mobile apps. Another tactic businesses use geo-fencing for is to send promotions or notifications to their former customers when they are near the business location and are flagged by the GPS, enticing the users to become a return customer. 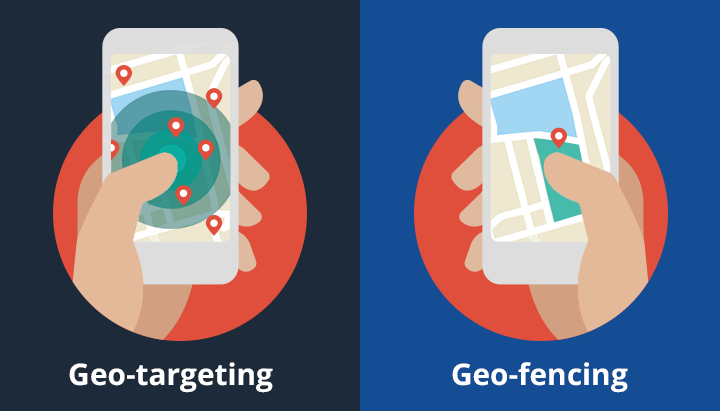 What is the difference between geo-fencing and geo-targeting? Geo-fencing can be only be used to serve display/banner ads. Facebook and Google do not provide geo-fencing capabilities, so you are limited in regards to platforms. Geo-fencing also does not allow demographic targeting to be incorporated, so if you are focused on serving ads to a particular age demo, you will be unable to do so with geofencing. Geo-fencing is typically used for impulse purchasing and rewarding former customers. For example, as you walk by a coffeeshop, if you have your Scrabble app open, you might see an ad within that app for the coffee shop you are close to. Geo-targeting is a more general term that applies to many types of online advertising. By geo-targeting a region or location, you are specifying where your ads are being shown. Geo-targeting does not require the user to be in a mobile app at the time, but rather can be used across any Google search or Facebook advertising. You can target by town, city, zip code, DMA, state, country or by drawing a radius on a map. Targeted to business’ location to show only to relevant users. Can target a competitor’s business location in an attempt to steal market share. Can send promotions or incentives to users that are near the business location. Geo-fencing is typically considered top-of-the-funnel advertising, as businesses display their ads to users that aren’t directly searching for a product or service. Targeting competitors’ customers by location can be costly and may be unsuccessful in stealing market share. Typically focuses on impulse purchases, such as our coffee example, or consumables. Not as relevant for high-value purchases or hearing aids, which typically have a long consumer journey. Requires user to download an app on their mobile phone to receive the advertising. Requires user to be BOTH using the app in question, as well as be located near the business that is advertising. Flexible targeting options surrounding a business’s location to show only to relevant users, including exact location, zip code, dma, town, city, state or region. Can target users across any device, including phones, tablets and desktop computers. Available on Google and Facebook, world’s most advanced advertising platforms. None! For B2C businesses to tap into their local market, it is a mandatory tactic for their marketing strategy. For clinics with multiple locations, it is best to not overlap the geotargeting when running separate campaigns for each clinic, so they do not compete against each other in the bid auction. Geo-fencing via mobile apps is not a service we currently provide, nor do we plan to. As customers have already moved down the purchase funnel to a competing clinic, they may have zero need or interest in another clinic they are seeing ads from. Also, you cannot target by demographics, which is critical when trying to reach our ideal customer in the hearing industry. Geo-fencing is cost-prohibitive and from our initial research would not provide a great ROI for our target customer base. We pride ourselves on accurate targeting in Google search and Facebook advertising via geo-targeting; meaning we draw a 10-20 mile circle around a practice to garner relevant traffic and leads. Our recommendation is to enhance a clinic’s online presence to attract potential patients where they’re already intently looking for hearing aids or a local clinic – online in search and in their Facebook feeds. Find out more about our advertising options here.